Danielle, who marched in the Lehigh Valley guard in 2003, sent in this one. "This was a picture taken on the way home from a competition in Brick, N.J. That weekend we traveled to Brooklyn, N.Y. and Brick on a school bus to save money for the truck we were going to have to rent for tour, since our trailer had been destroyed in an accident in June. We made the most out of the hot school bus rides. 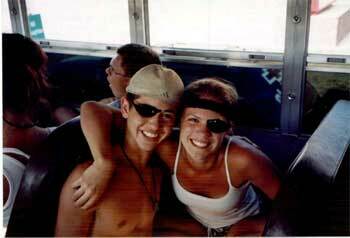 This is a picture of Evan (horn line) and Andrea (guard) making the most out of Evan's broken shades." Thanks Danielle!